To celebrate arrival of 2014 Halloween, WinXDVD software hits the Halloween giveaway by offering 1,000 free copies of WinX DVD Copy Pro, the powerful DVD copy software to customers every day during the period from now to November 4, 2014. Everybody can grad this chance to win WinX DVD Copy Pro free for backups of awesome Halloween movies DVDs. WinX DVD Copy Pro, specializing in cloning DVD discs, enables users to backup any DVDs of movies, TV shows, concerts etc, even the latest copy-protected DVDs to black DVD disc, ISO image, VIDEO_TS folder and deliver lossless video/audio quality for a long-time storage. In turn, it is able to burn ISO image and DVD folder to DVD disc. Beside primary DVD copy solutions, it can backup particular DVD titles or chapters to a single MPEG2 file, which is very helpful for gaining favorite episodes of TV series for Halloween, for example The Walking Dead, America Horror Story. It is also capable of extracting video/audio only from DVDs. Thanks to straightforward interface, WinX DVD Copy Pro is very easy-to-use even for a green hand. Low CPU cost of less than 1% and fast copy speed drive WinX DVD Copy Pro to be a pretty efficient program, only taking about 12-17 minutes to produce a 1:1 DVD copy. Certainly, Pumpkin, trick or treat and costume party are always the theme of Halloween, while to enjoy horror and thrilling movies is also a good choice in this exciting festival. Why don’t you catch this big opportunity of WinXDVD Halloween giveaway to gain WinX DVD Copy Pro as a Halloween gift to backup friable DVDs for protection and have a more enjoyable Halloween movie moment with friends and families? It’s not the end of WinXDVD Halloween promotion. 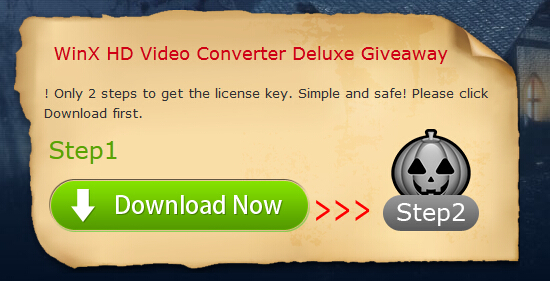 The featured and highly appreciated WinX HD Video Converter Deluxe involves in a giveaway as well. Simply share this Halloween giveaway on your Twitter or Facebook after free downloading WinX HD Video Converter Deluxe to win the license key. Easily convert any HD/SD videos to AVI, MP4, WMV, MOV, iPhone 6/6 Plus, iPad Air 2/Mini 3, Samsung Galaxy Note 4/Edge etc, for example, recorded Halloween party videos with HD camcorder to iPhone/iPad. Download and convert YouTube Halloween videos and any other videos from YouTube. Create Halloween photo album to video with scary background music. Keep an eye on WinXDVD 2014 Halloween giveaway and special offers valid until November 4, 2014. More details about discounted Halloween gifts will be unveiled. Relevant!! Finally I have found something which helped me. Appreciate it! Thanks for an information but I missed it out!!! I am really pleasant to read everything about Halloween Giveaway. Thank you so much for sharing information, that’s really excellent and keep up writing.